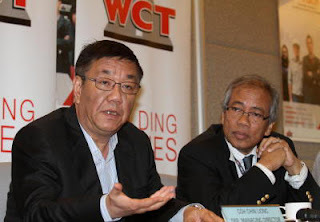 SUBANG JAYA: Property developer Bolton Bhd aims to achieve RM1 billion in sales by 2014 from RM600 million currently, said executive chairman Tan Sri Azman Yahya. "Currently the company has RM619 million gross development value (GDV) of on-going projects and RM3.5 billion GDV of upcoming sales," he told reporters after signing an agreement to raise RM370 million and seal a joint venture development in Kota Kinabalu with Mobuild Sdn Bhd. The fund raising agreement comprises RM230 million sukuk, managed by Affin Investment Bank and guaranteed by Danajamin Nasional, and a RM140 million five-year revolving loan by Affin Bank Bhd. Azman said the money will be used for working capital and to acquire strategic landbanks. "With this new fund raising exercise, we are now poised to embark on a landbank acquisition exercise to sustain the growth of the company for the next 10 years and beyond," he said. Meanwhile, the 50:50 partnership with Mobuild will see Bolton entering Sabah to build 500 units of luxury condominiums and landed villas with a GDV of RM480 million in Kota Kinabalu. The project, on a 4.2ha plot, is expected to be launched in the first half of 2013. Going forward, Azman said Bolton is vying for strategic land deals in Penang and Kota Baru to develop high-rise residentials. Currently, Bolton's real estate landbank spreads across 404.7ha in the Klang Valley, Kedah and Penang. KUALA LUMPUR: Property developer, United Malayan Land Bhd (UM Land) is set to develop a mixed commercial and residential project in Medini, Iskandar Malaysia with a gross development value of RM1.4bil. The proposed development in the southern development region will include townhouses, apartments, service apartments/small office house office (SOHO), hotels, retail promenade with food and beverages outlets and a specialty retail centre. “The project is still in planning stage and it is expected to commence in the third or fourth quarter next year,” group CEO Charlie Chia tolf reporters after the signing ceremony for a lease purchase agreement between UM Land and Iskandar Investment Bhd (IIB) here yesterday. The development will be implemented in four phases and would take six to 10 years to complete, Chia said, adding that the project will be located on the land UM Land acquired from IIB today. Worth RM83mil, the 5.35 hectare land acquisition was entered through UM Land’ wholly-owned subsidiary, Lextrend Sdn Bhd, and IIB’s wholly-owned subsidiary Medini Development Sdn Bhd. Also present at today’s event was IIB President and CEO Datuk Syed Mohamed Syed Ibrahim. KUALA LUMPUR: UMLand Bhd is confident that its soon-to-be-launched project in Medini Iskandar will be snapped up by foreign buyers. Its group chief executive officer, Charlie Chia, said 70 per cent of its boutique service residences known as Somerset Puteri Harbour apartments had been bought by foreigners including Japanese and Singaporeans. UMLand's subsidiary Lextrend Sdn Bhd signed a lease purchase agreement with Iskandar Investment Bhd yesterday for 5.2ha of prime development land in Zone B of Medini at RM82.49 million. Strategically located at the junction of the gateway to Medini and near Legoland, the land will be developed into a mixed commercial and residential project comprising business and lifestyle components with an expected gross development value of about RM1.4 billion. "This real estate jewel is expected to be launched in the second quarter of 2013," Chia said at a media briefing yesterday. UMLand is also working with UEM Land to develop a mixed development project at its second parcel of land. "With its strategic location neighbouring Singapore as well as its range of attractive fiscal and non-fiscal incentives, Medini@Iskandar Malaysia is poised to attract a growing influx of foreign and high level corporate investments." UMLand has projects in four out of five flagship zones of Iskandar Malaysia and they include Bandar Seri Alam, Taman Seri Austin, Somerset Puteri Harbour and the forthcoming JB City Centre. Iskandar Investment president Datuk Syed Mohamed Syed Ibrahim said the Lextrend projects will be implemented in four phases and are scheduled for completion in the next three to five years. Iskandar Malaysia wants to create an eco-system of a modern metropolis and a liveable city but its ultimate objective is to nudge capital appreciation for the real estate properties in Johor. It May be an end to a long wait for buyers of a low-cost housing project in Taman Sungai Yu Indah, Kampung Sungai Yu, Tanjong Karang, as the project will be revived and expected to be completed in March 2014. State Housing, Building Development and Squatters Committee chairman Iskandar Abdul Samad said there were around 300 units of low-cost houses. “It was a joint venture between Permodalan Negeri Selangor Bhd (PNSB) and a private company. “I have received many complaints from buyers. They have to pay their loans to the bank and rent a house while waiting for the project to be completed and it is a burden to them,” he said. Iskandar was responding to a question by Sulaiman Abdul Razak (BN - Permatang) who asked for the latest updates of the progress and when could the buyers move in. Iskandar added that he had raised the issue several times at the state assembly meetings. “I was told by the Kuala Selangor District Council that the project was to be revived and completed by 2010. But till now, it is still an abandoned project,” he said. Iskandar said that one of the ways to revive the project was to convert it partially to medium-cost houses. “One of the reasons that the project was abandoned is because the developers did not have the approval from the Selangor Land and Mineral Department,” he said. Sulaiman said this was not a valid reason as the department was under the state government. “How can it be converted to medium-cost houses when the structures have been built?” he asked. Islander clarified that only some, of the structures were built, hence the remaining ones will be converted to medium-cost houses. “It is up to PNSB to decide how many will be converted,” he said. Lee Kim Sin (PR-Kajang) asked what action would be taken against developers that fail to deliver on time. Iskandar replied that directors of those companies would be black-listed. “It is insufficient to just blacklist the companies as each project is undertaken by different companies. “Even then, some people use proxies and register the company under their spouse’s name,” he said.